1917: 1/2 anna (bright) red orange, mint vertical tête-bêche pair; large margins all round, without gum as issued. 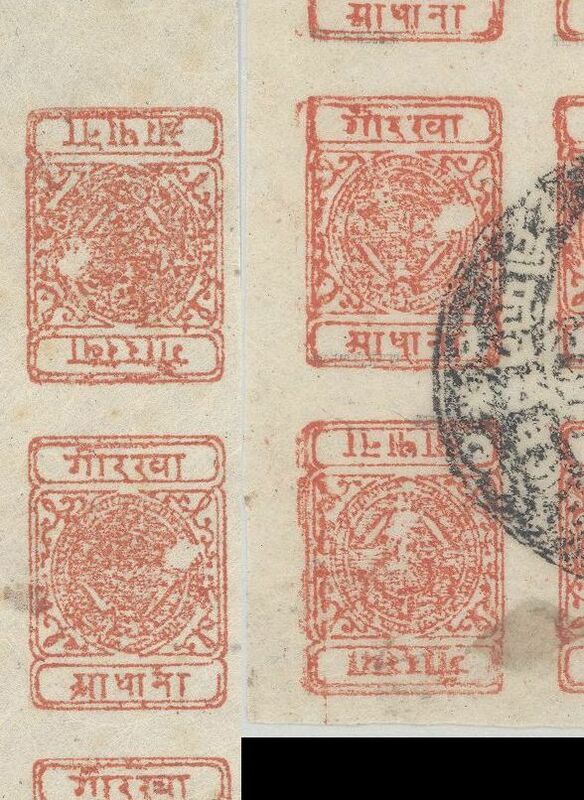 An extremely rare variety and the key stamp of Nepal. Cert. Calves (2009) Gi 35a = unpriced/Scott = $ 3'500 as normals. The stamps are indicated as having an certificate by Calves, but Calves is not registered as examiner for Nepal. What are your opinions on this pair? Please note the distance between the two stamps. The gap seems a bit too wide compared to those on the other settings that I have. How does this gap compare to those on your large block of the orange issue? indeed, a good idea. The Tete-Beche Pairs of the large blocks I had in my collection are shown below. Stephan Bildheim and I have come to the conclusion that this pair is a forgery. I downloaded the picture, cut the top inverted stamp out and rotated it in order that it could be directly compared to the bottom stamp. It is slightly larger. However, if you compare the two circled areas, you will note that they are identical. They have exactly the same gap in the inner line, are exactly the same shape, and both have the same small dot next to the outer frame line. Indeed, you will note that after making allowance for the small difference in the size of the stamps and for the smuggy printing of the bottom stamp (on right), all features on both stamps align. The cliches of the genuine stamps are all slightly different and thus can be plated since they were individually molded. No two cliches could match up like these two do. Obviously someone has created a single cliche and directly copied it to create this pair. After I emailed Stephan this information, he discovered some old notes made by the late Nepalese specialist, Jochen Heddergott, alluding to this forgery. Heddergott specifically mentions the gap in the inner line shown in the circled area as being indicative of this very dangerous forgery produced in the 1960's. I had also contacted Mr. Heddergott, a well known authority on Nepal and also he confirmed that the item is a forgery. I am extremely pleased to learn that Mr. Heddergott is still with us. I have xerox copies of what I believe was his collection that was sold through Proud-Bailey in 1979. It was magnificent. I have sent a Email to Corinphila with a link to this discussion and the information that the item is most likely a forgery. So far no answer form them an i doubt i will get an answer. Interesting to see if the item will be pulled from the auction or still offered. ... and the pair is offered again, this time at the June 2011 Gärtner Auction, Lot No. 1956, Start bid Euro 2000 (US-$ 3000 more or less at current exchange rate). Nobody bought it. I think it was withdrawn. I have a scan of the certificate by Calves, but I don’t know how to send it. May be anybody can tell me? The lot at Gärtner was withdrawn because me and some other collectors sent a mail, informing them about the forgery. I also sent an email to Christoph Gärtner then. Before that this pair was withdrawn at Cherrystone (Sept 2007) and at Corinphila (Dec 2010). I will send the certificate to your private email adress. And afterwards you please explain me how to integrate in a posting in the forum. Be suspicious of all half anna vertical tete-beche pairs. I have recently purchased 10 pairs from someone in Hong Kong and a further 6 pairs from a dealer in India 3 of which were orange. They were all sold as forgeries but they are extreemly good and very difficult to seperate from genuine ones. In fact the only difference I can find is that they are on a thin smooth native paper and if you run your finger over the surface they do not have the slightly rogh feeling of the genuine stamps. If these tete beche pairs are taken in isolation and placed in a general Nepal collection you would be hard pressed to spot them. 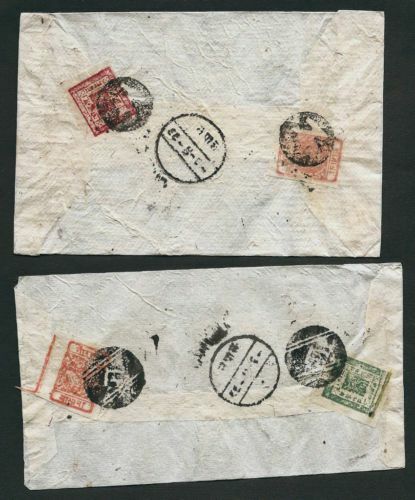 Just seen at Ebay, 2 Nepal covers with 1/2 Anna orange stamps... and additional classic stamps. How stupid someone has to be to buy something like that? I saw these also and emailed the dealer. He has pulled them off eBay. Sometimes they are made by a photographically copy. In this case a fake may be dangerous and difficult to identify. I asked the seller to remove it from ebay. Sorry, I wanted to write: "Already 1 (one) bid …….."
Anyway, today the sellewr removed this item from ebay.